I first read about this mask on sokoglam.com, and I have to say it does live up to the cult status that it gets in Korea. Unfortunately, it was completely sold out on sokoglam when I wanted to order it, so I got mine from koreadepart.com, which was only around $10 (including shipping) but it took almost a month to arrive! The mask comes in a fun little container that makes it look even more like homemade jam. And right when you open it, a wonderful waft of fresh strawberries hit your nose. The mask is a nice dark red color, thick with sugar and strawberry seeds. It seriously smells and feels like strawberries are the main ingredient in this, but alas it is not. Ingredients: Caprylic/Capric Triglyceride, Sucrose, Glycerin, PEG-7 Glyceryl Cocoate, Euphorbia Cerifera (Candelilla) Wax, Cetyl Ethylhexanoate, Stearalkonium Hectorite, Butyrospermum Parkii (Shea) Butter, Lanolin, Macadamia Ternifolia Seed Oil, Limnanthes Alba (Meadowfoam) Seed Oil, Fragaria Vesca (Strawberry) Seed, Sorbitan Laurate, Fragaria Ananassa (Strawberry) Seed Oil, Water, BHT, Ethylhexylglycerin, Phenoxyethanol, Caramel, CI 17290, CI 17986, Parfum. As you can see, sugar is the main ingredient in this mask, for its exfoliating purposes. 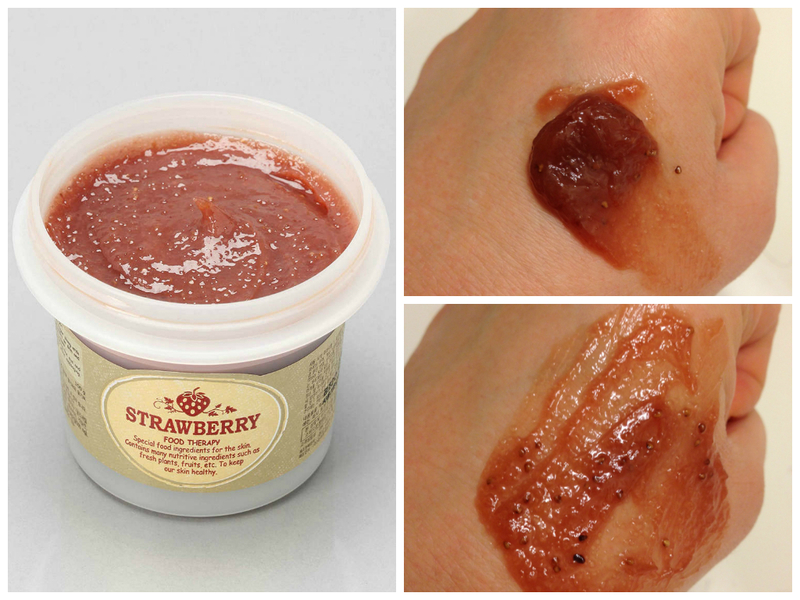 The strawberry seeds also give a little bit more exfoliation. And then of course there’s strawberry seed oil. I’m actually really surprised that this also has a lot of moisturizing ingredients in it like Shea butter and Macadamia Seed Oil. I ran the ingredients through cosdna.com and I’m happy to report that there’s nothing in this mask that should cause problems for people with acne-prone or sensitive skin. Sucrose: Brown sugar is actually a great exfoliator for sensitive skin because the grains are smaller, and thus gentler and softer than other sugars. Brown sugar also contains glycolic acid, an AHA, that helps to break down the outermost layer of skin to reveal fresh, clear skin. AHAs are great for helping reduce fine lines. 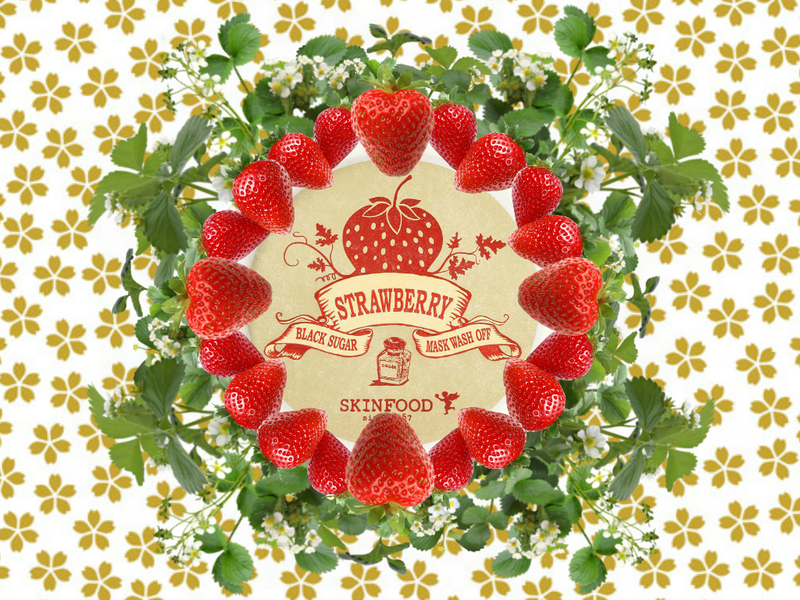 Fragaria Ananassa (Strawberry) Seed Oil: This oil is actually very high in linoleic acid, which is great for acne-prone skin. Strawberry seed oil is also very high in antioxidants. It’s great for added moisture and protection for the outer layers of the skin. While there is a lot of sugar in this mask for exfoliation purposes, the added moisturizers definitely makes this very soothing for sensitive skin! I generally stay away from manual exfoliation now (because the chances of overdoing it are so high), but I love how gentle this mask feels and how smooth it leaves my skin. The consistency of this mask is just like a thick jam. I can definitely feel the sugar and strawberry seeds exfoliating my face as I spread the mask on my face. The sugar in the mask is an AHA exfoliant, so there’s not much scrubbing that needs to be done to make this an effective exfoliator. I then leave the mask on 10-15 minutes (the recommended amount) and I jump in the shower to wash it off. Because I want to keep manual exfoliation to an absolute minimum, I don’t scrub the mask clean off my face. I let the water from the showerhead naturally rinse the mask off the face, then follow up with my CeraVe Facial Foaming Cleanser. When I jump out of the shower, my face feels and looks clean & bright, but not stripped. Of course, you can use a little more scrubbing with your fingers to exfoliate your skin more. I’m sure this scrub will gently and effectively take off any flaking skin. But I thankfully don’t have flaking skin right now, and I want to be careful not to irritate my rosacea, so I use this in the most gentle way possible by letting the sugar’s natural AHA to do most of the work. I use this mask about once a week (in addition to using my konjac sponge every other day) and it provides a nice amount of gentle exfoliation. Speaking of AHAs… do not use this mask in addition to any AHA exfoliator. I made the terrible mistake of using this mask once while I was still using Silk Naturals 8% AHA toner, and this mask ended up being too much exfoliation for my skin. My face turned bright red like the mask itself! But when I’m not using an AHA toner, my skin really loves this mask. I’m really impressed with this simple, gentle, exfoliating mask. It leaves my skin fresh and glowing, but not stripped. This mask is really popular in Korea, and I completely understand why! Pros: Effective, gentle exfoliator with an amazing smell! Ah, another product I’ve had on my wishlist! I thought it was only a manual exfoliator, so I was a bit scared of damaging my skin (the original black sugar mask was a tad too rough for my liking) – you’re the first reviewer I found to point out it’s an AHA exfoliator! Now I’ll have to get it! Thank you for your wonderfully in-depth reviews! Thanks, Evelyne! Yeah, it is supposed to be an AHA exfoliator. Leave it on as a mask, and then rinse away. Or, you can also use it as a manual exfoliator if you want to. It’s not too harsh! Another great exfoliator is the konjac sponge. Read my review and order one!